This preoccupation with individuality initially manifested in Refn’s first film, Pusher. In the DVD commentary to the Pusher trilogy, Refn explains that the films were directly inspired by films such as The Battle of Algiers (1966, dir. Gillo Pontecorvo), The French Connection (1971, dir. William Friedkin), Mean Streets (1973, dir. Martin Scorsese), and Bad Lieutenant (1992, dir. Abel Ferrara). All four of these films feature aggressively masculine characters who position themselves as rugged individuals either due to ethnic or cultural influences that dictate how they should act as men, or as a direct result of a desire to conform to the masculine landscape of their chosen profession (Coruzzolo, 2012; Sharpe, 2012; Nicolini, 2013). In Pusher, Frank and Tonny are wannabe gangsters, and as Andrew Nestingen (2008) asserts, gangsters represent the supreme individuals in contemporary society. Therefore, Frank and Tonny are positioned as being desperate to establish themselves as powerful individuals worthy of respect. In Pusher, Frank is desperate to establish his masculinity, despite the fact that he doesn’t conform to the hegemonic ideal defined by traits such as individualism. In order to establish their gangster personas, Frank and Tonny have appropriated a number of signifiers from hip hop culture, which has become heavily associated with the masculine archetype of the Gangster (Kaminski, n.d.). In an attempt to emulate the powerful, hyper-masculine bodies that are often displayed in rap and hip hop videos, Frank and Tonny wear uniforms that consist almost entirely of track suits, hoodies, sneakers, and gold chains (Fig. 1). These are all cultural signifiers that are heavily associated with hip hop and gangsta rap, and indicate that Frank and Tonny are attempting to convey traditionally hegemonic masculine traits such as strength, virility, aggression, competitiveness, and violence (Horrocks, 1994; Bengtsson, 2012). More importantly, though, both characters place a particular emphasis on the notion of respect, which is a vital component of the gangster identity (Bengtsson, 2012). More importantly, though, respect is integral to Frank and Tonny’s overall performance of masculinity, because respect is one of the defining characteristics of global hegemonic masculinity (Jhally, Earp, & Katz, 1999; Green, 2008). Therefore, by appropriating signifiers from gangster subcultures into their own masculine identities, Frank and Tonny are attempting to establish themselves as the sort of supreme individuals that the Gangster archetype has come to represent. This, in turn, implies that they are engaging in a performance of complicit masculinity that conforms to and supports the dominant hegemonic masculine ideal, in order to benefit from the privileges of the hegemony. Similarly, Michael Peterson (Tom Hardy), the protagonist of Bronson, is attempting to conform to the Tough Guy archetype, which is another manifestation of the ruggedly individualistic masculine ideal (Canavese, 2013). Peterson is a powerful and altogether hypermasculine individual who rejects society, but he still falls somewhat short of the hegemonic ideal due to his use of language, sexual inadequacy, and emotional vulnerability (Palmer, 2011). More importantly, Refn considers Bronson to be his most feminine film (Fig. 2). This feminist reading of the character undercuts Peterson’s extreme hypermasculinity in a number of ways, most notably by introducing a strong undercurrent of homoeroticism throughout the film (Romney, 2010; Palmer, 2011). Despite all of this, however, Peterson nevertheless believes himself to be a rugged individual, and this indicates that Refn is once again attempting to draw upon the mythological masculine ideal in order to engage with a stable notion of masculinity that positions powerful men as stoic individuals. Fig. 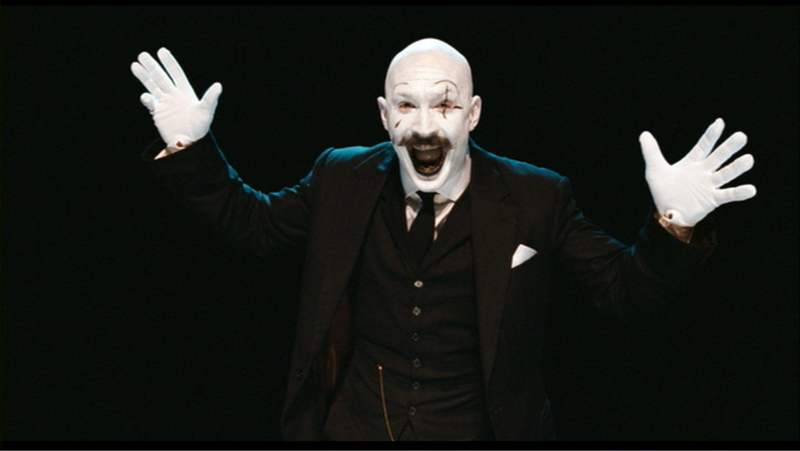 2: In Bronson (2009), Michael Peterson conforms to the hegemonic masculine ideal, but his masculinity is undercut by the introduction of feminine qualities. The Driver and One Eye are probably the purest representations of this phenomenon, as they most closely represent the type of powerful and heroic character that embodies the notion of stoic individualism. Both men exert their individualism primarily though their physical abilities, which often manifest in acts of violence. For instance, while One Eye relies on Are to act as his voice, the character is still able to express himself through physical violence, as he does when he escapes from his captors, killing them in a spectacularly violent fashion. He accomplishes this on his own, and proves that he does not need anyone else in order to make his way in the world. Similarly, The Driver asserts his individualism throughout the film, but never more graphically than he does during the particularly brutal sequence in the elevator. The Driver realizes that he is putting Irene and her son at risk, so after kissing her good-bye, The Driver proceeds to stomp one of Bernie Rose’s henchmen to death in order to drive home the point that Irene should get as far away from The Driver as possible. This reinforces the notion that while Irene may rely on The Driver for protection from Bernie and his thugs, The Driver relies only on himself for his own survival. Thus, the two characters assert their own individualism through violence, and this brings me to the next component of the mythical masculine ideal that Refn is appropriating in his films. In part IV, I will examine how violence contributes to the recurring notion of masculinity Refn draws upon in his own films. Bengtsson, T. T. (2012). Learning to become a ‘gangster’?. Journal of Youth Studies, 15(6), 677-692. Nestingen, A. (2008). Crime and fantasy in Scandinavia: Fiction, film and social change. (pp. 48-98). Seattle, WA: University of Washington Press. Robinson, S. (2000). Marked men: white masculinity in crisis. New York: Columbia University Press.